OS grid reference: SE 03604 03695. 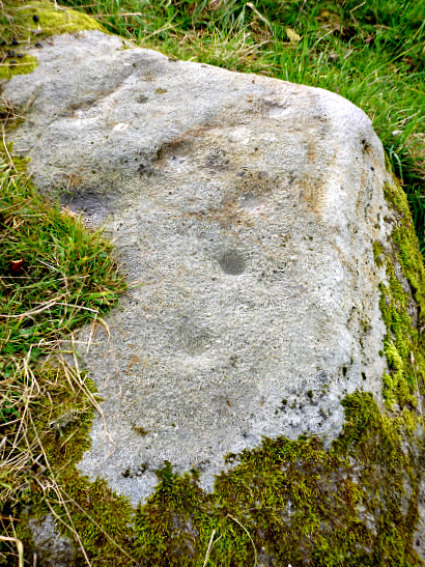 In a farmer’s field above Little Snowden Hill, near Steeton, west Yorkshire, there is a cluster of rocks in an area of rough ground which have prehistoric cup-marks, one of these rocks being locally known as ‘Dragon Stone’. And in the next field along there is another cluster of rocks which also look to have faint cup-marks. This so-called ‘Dragon Stone’ has several quite prominent little cups and there are also some grooves which may be part of the carvings here. However these carved rocks are on private farm-land and there is no designated footpath. To reach the rocks you “might” be able to walk along the overgrown track leading off from Hollins Bank Lane, nearly opposite the entrance to Tower Farm, if the wooden gate opens? Walk along the track past the house and barn of Hollins Bank Farm, then soon after the wooded area you’ll need to via off across the field to the south for 90m beyond the first field wall. Otherwise, you’ll need to find another way of reaching the site from the lane, if that’s possible? Dragon Stone, near Steeton, west Yorks. Cup-marked rock opposite Dragon Stone. In the corner of a farmer’s field above Little Snowden Hill there is an outcrop of gritstone rocks, or a cluster of rocks maybe. One of these known as ‘Dragon Stone’ bears many ancient cup-markings (rock-art). 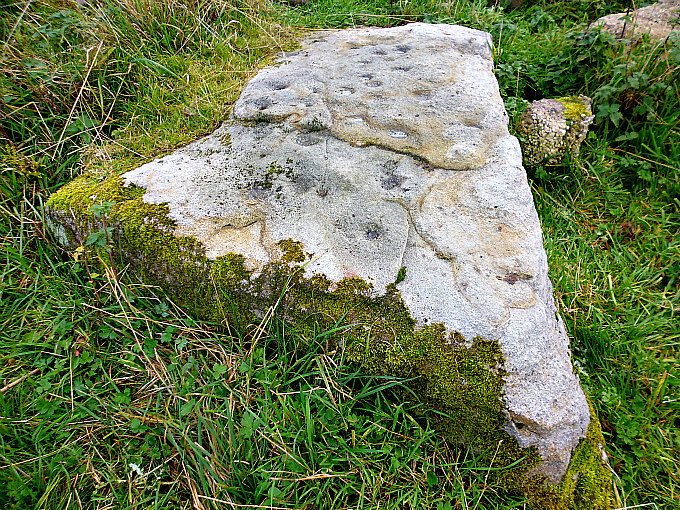 There are as many as 20 cup-marks on the this worn, flat rock, and around the sides and in the middle there are faint grooves running in a sort of circular fashion, but whether these were caused by erosion, or whether they are part of the carving, is not really known; and there is a crack in the rock which adds to the strange look of the stone. And why it is locally called ‘Dragon Stone’ is not known, although the rock might take on the look of a dragon at certain angles. On another rock, just opposite, and close by the wall there are a few more cup-marks, maybe up to 4 or more, although these can only be seen in a certain light and at an angle. This rock also has one or maybe two faint bowl-shapes made by erosion though these are often hidden away under a layer of lichen and grass. In the field beyond the wall (at SE 0354 4360) another cluster of rocks, one of which at least shows signs of a few faint cup-marks? 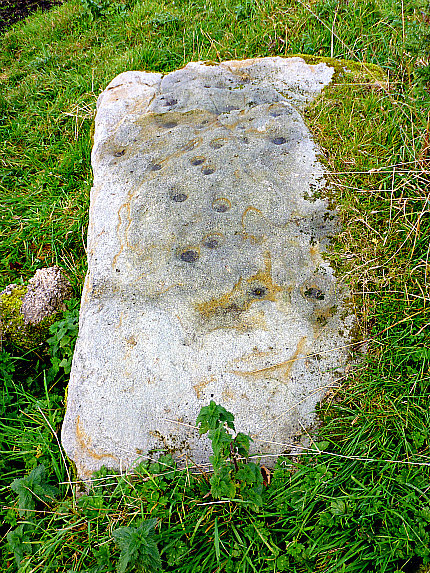 Categories: Cup-Marked Rocks | Tags: Dragon Stone near Steeton in west Yorkshire | Permalink.